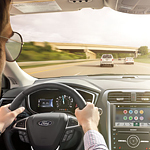 Things to Love About Ford Fusion Tech Features | Fred Martin Ford Inc.
Fusion treats drivers and passengers to a super-fast in-cabin Wi-Fi network with a 50-foot range. The AT&T-powered network permits up to 10 users on laptops or mobile devices, with 4G LTE speeds for surfing, streaming and downloading during daily commutes, weekend getaways and extended road trips. FordPass has a built-in feature that lets you track data usage in case you have self-imposed caps. Experience Ford Fusion tech today with a test drive at Fred Martin Ford Inc.